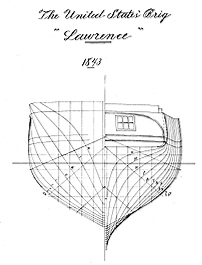 The Smithsonian's collection of watercraft plans, maintained by the History of Technology Division of the National Museum of American History, is a valuable resource for the maritime historian, the student of naval architecture, other scholars, the model builder, and craftspeople. To make this collection more accessible to the public, black-line reproductions of many of the plans are offered for sale. The following three publications contain descriptions of plans and instructions for ordering large-scale copies; these catalogs are only available by writing to the address below. The catalogs and plans belonging to the Smithsonian Institution are copyrighted and may not be reproduced in any form without prior written permission. This 250-page catalog lists plans of historic American watercraft -- bark canoes, clipper ships, fishing schooners, skipjacks, sidewheel steamers, harbor tugs, and many others. "Notes on Chesapeake Bay Skipjacks"
Unpublished plans by Howard I. Chapelle are also listed. 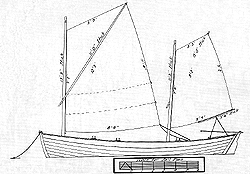 These include plans for historic yachts, pilot schooners, and small craft. This 76-page list includes plans for American sailing and early steam warships from the mid-18th century to 1900. Many are from Howard I. Chapelle's book The History of the American Sailing Navy. Some ordnance drawings also are included. This 70-page list includes ship design plans recently acquired from the Maritime Administration, U.S. Department of Transportation. Fifty-five vessel designs are represented, including plans for World War II Liberty and Victory ships, cargo vessels, passenger ships, tankers, container ships, and other designs from the 1950s and 1960s. The collection also includes 60 sheets of design plans for the famous superliner SS United States. Each publication is $10.00 (U.S.), postpaid. Foreign orders may obtain airmail by adding an additional US $5.00. Please indicate which catalog(s) you wish to receive and enclose a check or money order payable to the Smithsonian Institution for the total amount. Do not send cash. We cannot accept credit card orders. All foreign orders should be paid by check, in U.S. funds, payable on a New York bank. The majority of the Smithsonian watercraft plans are NOT original builder's plans. Most are the result of field documentation -- the process of taking the lines off historic vessels and half-hull models. Therefore, complete construction details and tables of offsets are not always available. Skilled naval architects and boat builders typically can develop tables of offsets from basic lines plans. In fact, we have heard from a number of boat builders who have built full-sized craft from Smithsonian plans. However, the Smithsonian cannot warrant the seaworthiness or safety of vessels built from its collection of study plans. For questions on design drawings for specific vessels, please write to the above address. We generally fill orders within four weeks of receipt.